A marine mammal is any of a diverse group of aquatic or semi-aquatic mammals that spend a considerable portion of their time in marine waters and depend on the ocean for food. There are four main groups of marine mammals: Cetaceans (whales, dolphins, and porpoises), sirenians (manatees and dugong), pinnipeds (earless seals, eared seals, and walruses), and several otters (the sea otter and marine otter). Some also include the polar bear with the marine mammals because polar bears spend many months of the year on the frozen sea, hunting from sea ice. They also are proficient swimmers. The cetaceans and sirenians are completely aquatic. Sea otters, although they can walk on land, can mate and raise their young entirely at sea. The pinnipeds spend considerable time on land, including giving birth and raising their young. There are about 120 species that are classified as marine mammals. Marine mammals are highly recognizable charismatic megafauna, meaning they are large animals with widespread popular appeal that are used by some in the environmental community use to achieve conservation goals well beyond just those species. Despite this, many populations are vulnerable or endangered due to a history of commercial exploitation for blubber, meat, ivory and fur. Most species are currently protected from commercial exploitation. California sea lions, members of the family Otariidae. As with all mammals, the marine mammals are characterized by the presence of hair and mammary glands, which in females produce milk for the nourishment of young. All are warm-blooded, breathe in air utilizing lungs, bear their young alive, and suckle them on their own milk. Some, such as the whales, have very limited hair, reducing drag in the water. Instead, they maintain internal temperatures with a thick layer of blubber (vascularized fat). However, the sea otter, unlike most marine mammals, has as a primary form of insulation an exceptionally thick coat of fur, the densest in the animal kingdom. Marine mammals are considered to have evolved from land dwelling ancestors and share several adaptive features for life at sea. These adaptations include generally large size, hydrodynamic body shapes, modified appendages, and various thermoregulatory adaptations. Different species are, however, adapted to marine life to varying degrees. The most fully adapted are the cetaceans and the sirenians, whose entire life cycle takes place under water, whereas the other groups spend at least some time on land. The polar bear is often regarded as a marine mammal because it spends many months of the year in a marine environment, albeit a frozen one. (Stirling 1988). It can hunt consistently only from sea ice and spends much of the year on the frozen sea. Its preferred habitat is the annual sea ice covering the waters over the continental shelf and the Arctic inter-island archipelagos. The polar bear tends to frequent areas where sea ice meets water, such as polynyas and leads (temporary stretches of open water in Arctic ice), to hunt the seals that make up most of its diet (Stirling 1997). 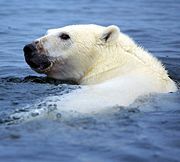 When the polar bear does swim in the open sea, it is extremely proficient and has been shown to cover 74 kilometers in a day. For such reasons, it is often considered a marine mammal. The sirenians and cetaceans are thought to be descendant from an ungulate ancestor, while the pinnipeds, otters, and polar bear are descended from a caniform ancestor. The morphological similarities between these diverse groups are considered to be a result of convergent and parallel evolution. There are some 120 extant species of marine mammals, generally sub-divided into the five groups bold-faced below, if polar bears are included (Hoelzel 2002). Since mammals originally evolved on land, their spines are optimized for running, allowing for up-and-down but only little sideways motion. Therefore, marine mammals typically swim by moving their spine up and down. By contrast, fish normally swim by moving their spine sideways. For this reason, fish mostly have vertical caudal (tail) fins, while marine mammals have horizontal caudal fins. Marine mammals breathe air, while most other marine animals extract oxygen from water. Marine mammals have hair. Cetaceans have little or no hair, usually a very few bristles retained around the head or mouth. All members of the Carnivora have a coat of fur or hair, but it is far thicker and more important for thermoregulation in sea otters and polar bears than in seals or sea lions. Thick layers of fur contribute to drag while swimming, and slow down a swimming mammal, giving it a disadvantage in speed. Marine mammals have thick layers of blubber used to insulate their bodies and prevent heat loss, among other functions. Sea otters are exceptions, relying more on fur and behavior to stave off hypothermia. Marine mammals give birth. Most marine mammals give birth to one calf or pup at a time. Marine mammals feed off milk as young. Maternal care is extremely important to the survival of offspring that need to develop a thick insulating layer of blubber. The milk from the mammary glands of marine mammals often exceeds 40 to 50 percent fat content to support the development of blubber in the young. Marine mammals maintain a high internal body temperature. Unlike most other marine life, marine mammals carefully maintain a core temperature much higher than their environment. Blubber, thick coats of fur, bubbles of air between skin and water, countercurrent exchange, and behaviors such as hauling out, are all adaptations that aid marine mammals in retention of body heat. Considerable research has been conducted on the incidence of diseases that afflict marine mammals in the marine environment. This work has addressed leptospirosis, phocine herpesvirus, neurological diseases, toxicology (Lavery et al. 2008), and other pathologies affecting marine mammals. Entire research organizations have developed such as the Marine Mammal Center to focus upon the rehabilitation and research functions of marine mammals. Hoelzel, A. R. (ed.) 2002. Marine Mammal Biology: An Evolutionary Approach. Oxford: Blackwell Publishing. ISBN 0632052325. Lavery, T. J., N. Butterfield, C. M. Kemper, R. J. Reid, and K. Sanderson. 2008. Metals and selenium in the liver and bone of three dolphin species from South Australia, 1988-2004. Science of the Total Environment 390: 77-86. Riedman, M. 1990. Evolution, Classification, and Distribution of Pinnipeds. In Pinnipeds: Seals, Sea Lions, and Walruses, 50–83. Berkeley: University of California Press. Retrieved June 15, 2007. Stirling, I. 1988. Polar Bears. Ann Arbor, MI: University of Michigan Press. ISBN 0472101005. Stirling, I. 1997. The importance of polynyas, ice edges, and leads to marine mammals and birds. Journal of Marine Systems 10(1-4): 9–21. Retrieved October 26, 2008. All links retrieved August 15, 2018. This page was last modified on 15 August 2018, at 15:52.